Abe Vigoda is, as usual, a mob boss who's getting the worst news of his life. It's terminal cancer, and he'll be dead in a matter of weeks. Abe is the capo di tutti capi it seems, a man who everyone fears, and now he'll be facing down his own ultimate end! A fine point is put on this by the doctor dropping off the news, who makes no attempt to hide his contempt for Abe, going so far as to announce that he only delivered the news in person so he could watch an evil man squirm. Which is an interesting idea, but I've got to say - perhaps not the smartest move. After all, Abe now has no reason not to kill you. Abe is miraculously able to restrain himself, however, and the doctor is free to go on his merry way - with his medical career being shattered, of course. Abe and his henchmen share a good laugh at the doctor's expense, which quickly turns into a violent coughing fit, as is the wont of men with terminal lung cancer. Abe is roused from his drunken stupor by a woman's voice - although that turns out to be a dream. It's actually his henchman announcing a caller - a scientist promising eternal life! 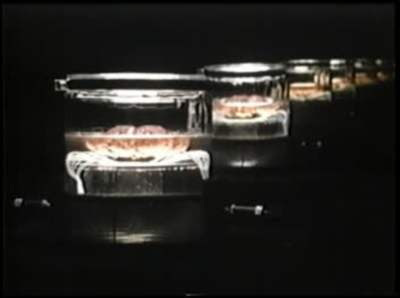 It sounds crazy, but the scientist claims to have developed a method for preserving the human brain indefinitely. For enough money, instead of slipping away from life, Abe's 'death' can feel like he's falling asleep, after which he'll dream indefinitely. Well, as long as the power in the machine runs, anyhow. Abe is incredibly skeptical, especially when he discovers that the cost of the service is ten million dollars! The scientist leaves on a classic power game - letting Abe know that if he's interested in this one-time-only offer he'll have to call a certain number the next day within a ten-minute window. There's a little foreshadowing to be built up before he makes the phone call, however - earlier the doctor mentioned that nightmares are often a side effect of the disease, and now we see Abe suffering from one. The scientist promised Abe his 'choice of dream', but will the twist be that Abe's lived such an awful life that he's only capable of having nightmares? That would be suitable ironic, I think. He makes the call, of course, but only after reminiscing about the time he had a cop murdered because he wasn't shown the proper respect during an arrest. In case we didn't already know he was awful. He waited too long, however, and the number he calls has been disconnected! Things are looking grim for Abe until the scientist takes pity on him, and sends him a new number in the mail. Abe calls it after having his henchman close out all his foreign accounts, and bring him all the money he's squirreled away over the years. Then Abe heads down to the 'afterlife' office to check things out. Naturally, the place is exceptionally sci-fi. The machine Abe is sitting on scans his brain, recording the locations of his best memories and most beautiful dreams. These are largely about his love for his wife, back when they first met. The bad dreams all seem to revolve around his monstrously abusive father. The scientist explains that he had to map out all the different parts of Abe's brain, so that they could know which memories to stimulate and which to avoid during his endless slumber. I think we can all see where this is going, yes? Abe still has a few loose ends to tie up. He collects the money from his henchman, and then tells him a tale. Abe reveals that the money was for his henchman, and that he wants the big lug to take over for him once he's gone. The henchman smiles, and then Abe shoots him in the head - making sure his good friend dies at the absolute best moment of his life. Now it's just time for the twist. Abe shows up at the lab, ready to be put in the dream state forever. The doctor performs the surgery and pops Abe's brain in a jar. Once it's in there, unsurprisingly, Abe starts having terrible nightmares from his awful life. All the abuse suffered at the hands of his father, the way he turned around and heaped it on his beloved wife, destroying her. 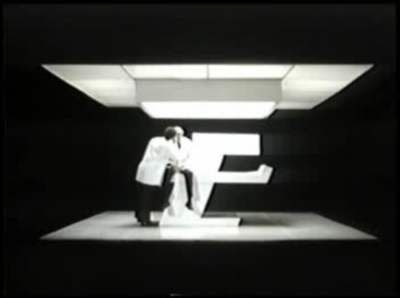 The scientist, you see, isn't sure that hell exists, so he wants to make sure that the rich and amoral experience it - or something close to it, at least. And he's got plenty of other customers suffering the same fate! 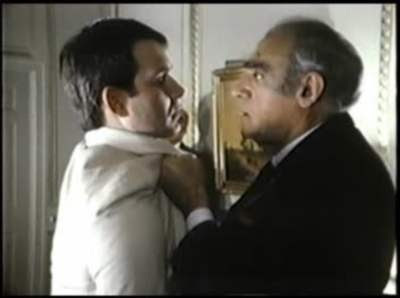 Maybe it's just the excellent acting of Abe Vigoda, or perhaps the legitimately wonderful premise, but this was just an exceptional episode of Tales From the Darkside - even if the ending was pretty well telegraphed. Good work, guys! Also, it's strange to look at how incredibly old Vigoda already looked thirty years ago. Man, that guy started looking decrepit and just kind of locked it in. Good for him.